Dec. 12 — Today, Occupy activists from Vancouver, Canada, to San Diego, Calif., disrupted and shut down West Coast ports in solidarity with port workers. Specifically, they embraced the port truckers’ struggle for union recognition and efforts by the International Longshore Workers Union to fight union-busting in Longview, Wash. They were also responding to federally coordinated attacks on the Occupy movement across the country. Once again, the largest protests were in Oakland, Calif. Despite continuous and well-publicized attempts by Oakland city officials and the Port of Oakland to discredit the port shutdown campaign, the all-day protest was massive. It started at 5 a.m. at the West Oakland Bay Area Rapid Transit station, in the shadow of the Port of Oakland. More than 2,500 Occupy activists, teachers, other union members, students and unemployed youth from all over northern California marched on the Port of Oakland to shut it down. 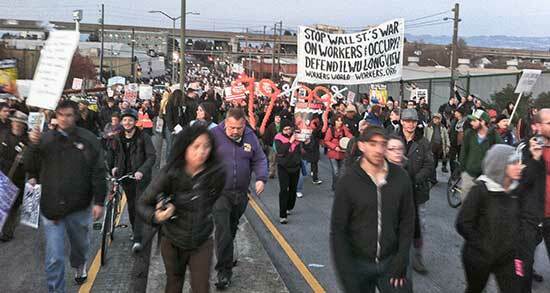 The main two terminals scheduled for day-shift work were closed and the longshore workers sent home by 10:30 a.m.
Later in the day, coordinated marches from Oscar Grant Plaza in downtown Oakland and the West Oakland BART brought out about 20,000 demonstrators, who quickly and effectively shut down the port. By 6 p.m., all longshore workers were being sent home, and the port was closed tighter than a drum. The afternoon rally in Oakland featured fiery speeches directly targeting capitalism. Speakers pointed out how sexism, racism and anti-gay bigotry are all spawned by capitalist oppression and how it is the exploitation of labor that is the source of capitalist profits. Scott Olsen, the Iraq war veteran who sustained a serious head injury during the October police attack on Occupy Oakland, addressed the crowd and announced he was again marching with Occupy Oakland. 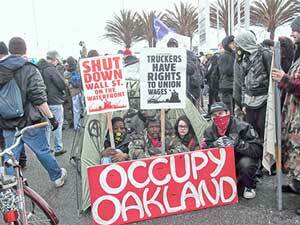 After shutting down two shifts, Occupy Oakland activists remained at the port to continue the protest in response to police attacks in San Diego, Seattle, Houston and other cities. Pickets were established at two port terminals prior to the 3:00 a.m. shift, which then was also cancelled, effectively shutting down the Oakland Port for 24 hours. Similar demonstrations were held up and down the West Coast, some aimed to shut down port terminals, others as informational solidarity demonstrations. Some 1,000 demonstrators in Seattle marched from downtown to the port there and were able to completely shut down the night shift at two terminals. The police attacked with tear gas and percussion grenades. One protester was pepper-sprayed directly in the face, and a number were arrested. Occupy Seattle decided to close down the night shift, rather than the day shift, so that the port truckers, who are mainly unorganized Africans and South Asians, would not be penalized. In Portland, Ore., some 500 people, including rank-and-file ILWU members, shut down the port entirely on the morning and evening shifts. The port arbitrator ruled for the ILWU, so the longshore workers were paid for four hours and sent home. Occupy L.A. and Occupy supporters from the central coast of California successfully slowed operations at the Port of Long Beach and Port of Hueneme, respectively. The Long Beach march started at Harry Bridges Park, named for the leader of the 1934 San Francisco general strike that won a unified longshore union and smashed racist divisions on the docks. Hundreds came — some media said 1,000 — to defend the right of truckers, mostly Latino/a drivers, to unionize, as well as in recognition of the ILWU in Longview, Wash., and the right of the Occupy Wall Street movement to continue without police repression and violence. Twenty-six Los Angeles truckers had been fired at Toll Group when they wore Teamster union jackets to work, sparking the call for the Dec. 12 shutdown. Goldman Sachs financial empire owns 51 percent of anti-union SSA Marine. Marchers filled the entrance to the ILWU parking lot before the 7 a.m. start time. They came from Pasadena, Long Beach, Los Angeles and other areas with OWS activism — 55 from Riverside, Calif., alone — including Teamsters in their jackets and a hunger striker from San Diego in a wheelchair. Occupy4Jobs.org signs read: “Bust Goldman Sachs, not our unions.” The back-up of cars grew, waited and then turned around, but still no trucks. Many police in a line pushed with batons against a wall of people determined to stop business as usual for capitalism for as long as they could on this day. More police came, not only from Long Beach but from Los Angeles, and the highway patrol. One man was thrown to the ground and arrested, his head bleeding. But the occupation of the road continued. Trucks were lined up, unable to enter. A tent was pitched in the roadway. By 10 a.m. the marchers were back in Harry Bridges Park, but trucks were backed up to the freeway and the ILWU parking lot was empty. In Houston, a group of demonstrators were held face down, handcuffed, while cops brazenly placed a tent over them, preventing onlookers from witnessing what was being done. Houston cops covered their badge numbers with duct tape before arresting 20 or 25 of the protesters. Occupy Denver gathered at the Wal-Mart Distribution Center in Loveland, Colo. Several people sat in front of the chain’s trucks to form a blockade, linking arms, and were dragged away and arrested. There were 13 arrests in all — a few just for jaywalking/crossing the street, others for the blockade/resisting arrest. In New York, a spirited march in solidarity with the port actions went from Zuccotti Park to several sites around the Wall Street area owned by Goldman Sachs. At 10 a.m. around 200 OWS activists went inside Winter Garden, a Goldman Sachs-owned mall, and began holding a rowdy demonstration. The police responded with violence, and there were more than 20 arrests. The usually busy mall was closed for several hours. In Japan, the International Labor Solidarity Committee of Doro-Chiba held a solidarity protest against Itochu, an affiliate of EGT which is trying to bust the ILWU in Longview. This historic day was the result of a coordinated effort among the many Occupy movements in port cities along the West Coast. It arose partially in response to the police repression against Occupy encampments across the country. These brutal attacks against Occupy sites were overseen by the Department of Homeland Security and the FBI. The federally coordinated attack against Occupy Oakland on Oct. 25 was followed by police attacks against Occupy encampments in other locations, including the eviction of the initial OWS from Zuccotti Park in New York. But instead of crushing the movement, this vicious repression has only made it grow. The movement of cargo was halted or disrupted along the entire West Coast. Today’s coordinated actions demonstrated to the 1% who rule this country that the Occupy movement is here to stay, and will continue to fight for economic justice for the 99% and against police repression. 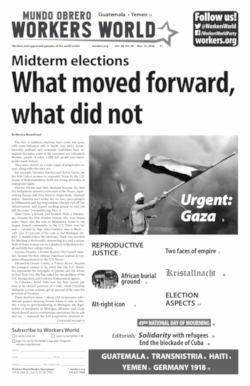 Contributors to this article include Judy Greenspan, Paul Teitelbaum, Terri Kay, Jim McMahan, Dave Welsh, Cheryl LaBash and Caleb T. Maupin.